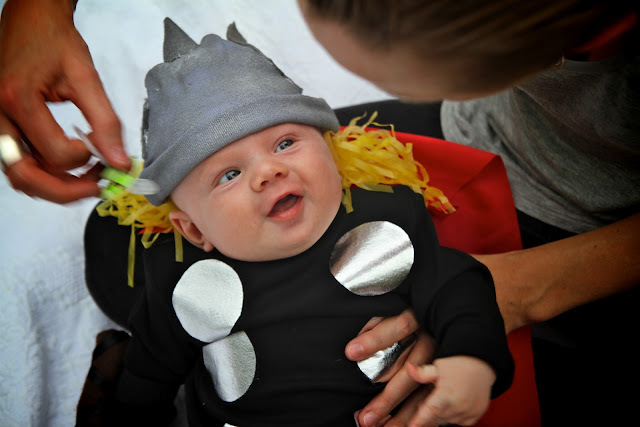 Here is the third post to the Homemade Thor costume. This is the instructions on how to make Thor's hat! The first thing you are going to do is make the little spike at the top of the hat! You can make it as big or small as you like! 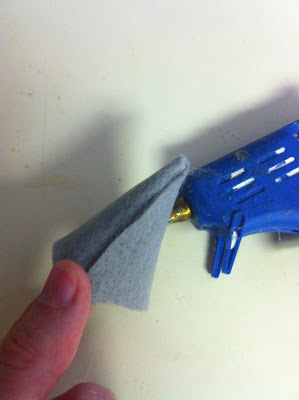 Just roll a piece of gray felt as pictured below and hot glue it together! After this step, I leveled out the bottom edge with a pair of scissors. 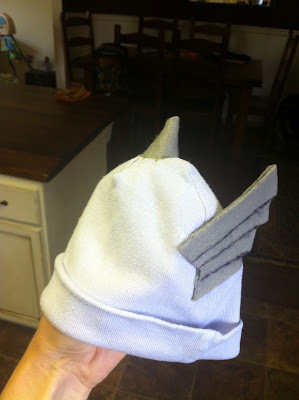 Then I hand stitched the "spike" to the top of the hat! 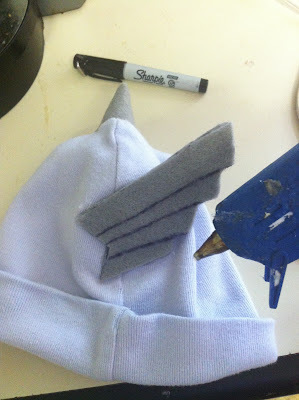 Next, you will make the wings for the side of the hat. 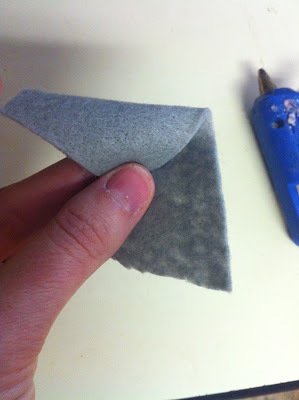 I just drew out this shape on a piece of paper and then traced it on the gray felt four times. You can make these as big or as small as you would like depending on your hat. *Example: The longest line on my wing is about 2 1/2 inches long. 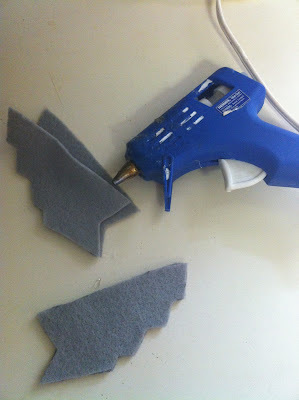 I then hot glued two of the wings together so they can be a little more sturdy. If you only used one it would be to floppy and wouldn't stick up! Then on the side of the wing that is going to show on the hat, I drew the lines to the wings with a black sharpie. 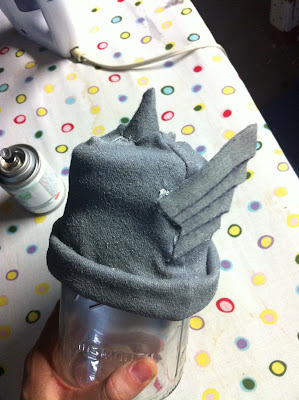 Then, simply hot glue the wings to the hat! 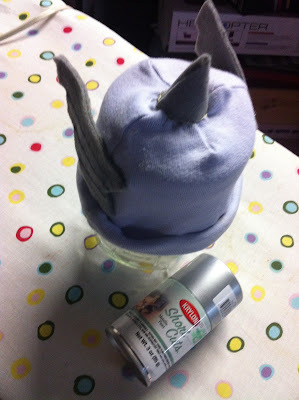 Next, I put the hat on a glass jar. you don't have to do this but I found it easier to paint this way. Then spray paint your hat silver! I wanted to have some hair sticking out of the hat. The dollar store is the best place to look for something that looks like blonde hair. Sometimes they have play yellow play dress up hair but they didn't have it when I went. 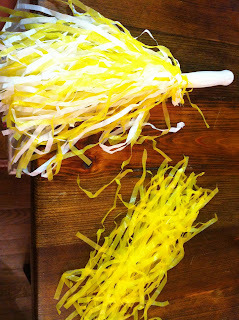 However, they had these cool yellow and white pom poms! I just separated out the yellow from the white! 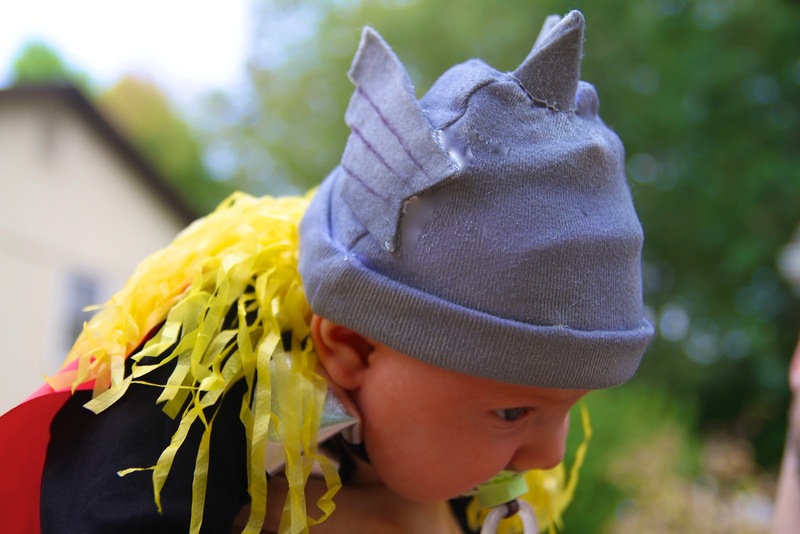 You could also use yellow yarn for the hair. 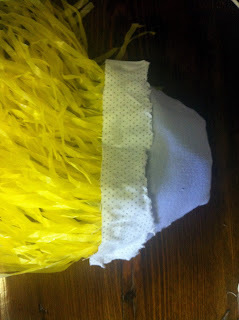 I simply hot glued the yellow pom pom strips to the back of the hat. 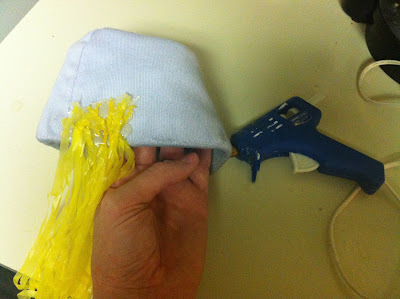 The hot glue is hard and I didn't want it to hurt my baby's head so I then glued a piece of fabric over top of it! What I am thinking of doing is once Halloween is over I am going to take off the hair so my son could still wear this cute hat during the winter! This hat is the CUTEST!!! The hair adds such a great touch for Halloween but for everyday wear just leave off that step! 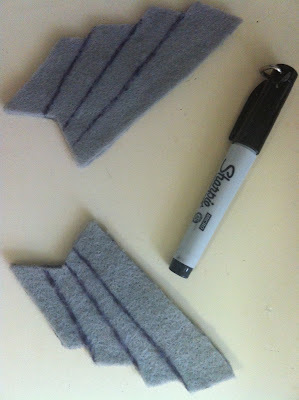 If you would like to see how I made the costume click HERE! 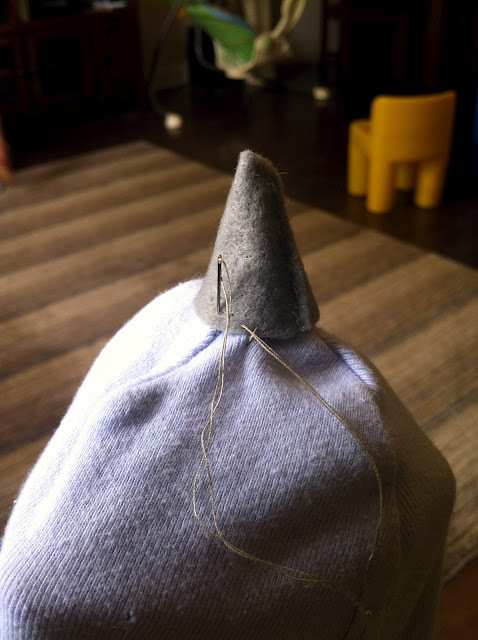 If you would like to see how I made the plush hammer click HERE! 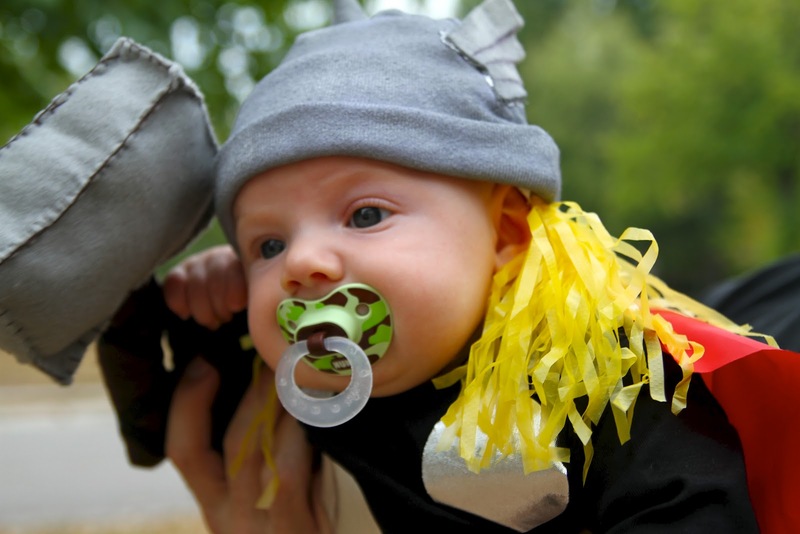 That is one REALLY cute baby! And I love the Thor stuff you've been doing!